What is interesting to know that in the photo, Disneyland Paris is using the Tokyo DisneySea Duffy design. LOL! I'm sure it will be on Glee soon enough! Awww, so cute! 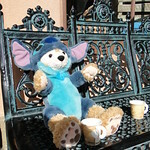 I am so happy they still have Duffy at DLRP, hope he stays around for a while and I get to visit him there - Bonjour Duffy! Friday night, I went to a food truck rally and brought home a bag of kettle corn. Duffy immediately tried to claim it as his own. "Look! It's as big as I am!" Shellie May had ideas of her own. A fight ensued.... ending with Shellie May walloping Duffy. They finally agreed to share it. I LOVE Gangnam-style Duffy! 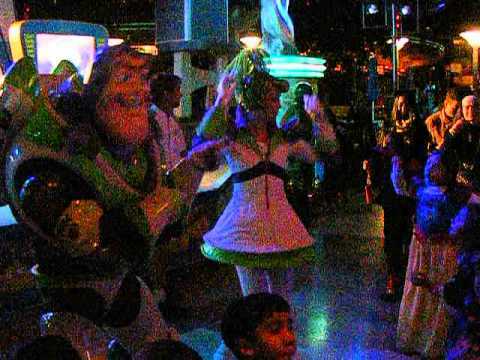 (And Buzz! LOL) Aimster, your poor Duffy...is he a gentleman (gentlebear? ), or more just not good at fighting? Love Scarecrow Duffy! Diznygrl, your bears' costumes are perfect and they are SO CUTE with their candy! Great photos again, Becx. I'm a bit jealous; I love New York! Glad you are OK, Gurgi. Here are a few pics of us at the terminal waiting to board the Disney Magic! 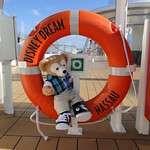 As this was Duffy's second cruise he came with us through the silver check in line! Then we waited so see Uncle Sam Mickey! I can see this ship, look! Here comes Statue of Liberty Minnie! The Disney Magic, with a New York back drop! 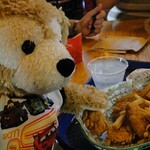 Thnaks, hopefully you and Duffy will get to go to NYC someday! Love those pics, it's like mini me of Cast Members! We was lucky enough last week to meet Duffy at Disneyland Paris in his scarecrow outfit and Pirate outfit! We also meet Duffy at the beginning of October at Disneyland Paris. I'm so glad she gets to wear her Duffy dress to meet Duffy! You did such an amazing job on it, and I'm sure everyone asked about it. Duffyholic, those pictures are awesome! I just love that dress! I hope you both had fun at DLRP! Which hotel did you stay in? During our first trip at the beginning of October we stayed in the Hotel Cheyenne and during the Halloween Soiree we stayed in Paris! Both trips were very magical!!! So I finally GOT Duffy on the Jumbo Tron at a Hockey game in Ontario. We are fans of a minor league hockey team and have gone to all home games since the seaons started and I've been trying to get Duffy on the Jumbo Tron screen and he finally got on last night! I'm trying to see if anyone got a photo or video of it as proof as I couldn't take any because I was making Duffy dance. The crowd got a kick out of it! HA! That's awesome. 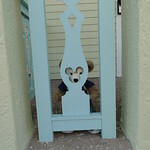 My Duffy has been on the jumbo tron at Tampa Bay Rays games several times. He's even been on tv during some Rays broadcasts. The guys at Sun Sports (regional channel that shows the Rays games) totally love him. He's gotten photos with a few of the announcers/commentators (Todd Kalas, Barry LeBrock & Laura McKeeman - who is also Miss Florida 2012). Oh this is inspiring..I have to get full Reign gear for him (the team is the Ontario Reign) and get some players to sign and take photos with him! Duffy met a lot of Rays players this year and got photos with them. One is even following him on Twitter (Chris Gimenez)! It was awesome because last year everyone seemed too chicken to pose with him. He's also good buddies with the Rays mascot, Raymond. They tweet each other all the time & Raymond gets excited when he sees Duffy at games. ha...Duffy also got a pat on the back last night by one of the Reign's mascot, the Knight. I love it! I forgot about this picture I took with Duffy all ready for some Hockey! 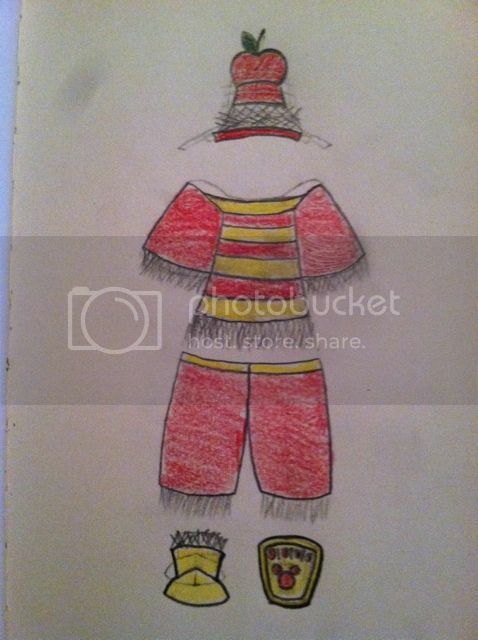 You can see the strands of hay on the hat, the shirt sleeves and the hem and near the pant legs. And since it's already fall/autumn, I added an apple on the top of the hat, because I typically associate them with the season and giving it the New England vibe.